Mark Lancaster Lusk, Professor of Trombone, became a member of the Penn State faculty in 1986. Prior to his appointment, he enjoyed a varied career with such diverse groups as the Woody Herman Thundering Herd, the Chicago Symphony Orchestra, the Eastman Wind Ensemble, and the Chicago Contemporary Chamber Players. Over the last 30 years, Professor Lusk has enjoyed an active playing career as a soloist, clinician, and freelance musician. For example, as a member of the Woody Herman Alumni Band, he has performed throughout the United States and abroad, including featured performances at jazz festivals in China, England, France, Finland, Germany, Italy, Malaysia, Norway, Portugal, Spain, Scotland, and Sweden. Lusk can be heard on three recordings with the Woody Herman bands; Woody's 50th Anniversary Tour, A Tribute to the Legacy of Woody Herman, and Live in London at Ronnie Scott's. Lusk enjoys playing both lead and bass trombone in a variety of regional bands, and is an active member of the Penn State Faculty Jazz Combo. Professor Lusk has performed on Broadway, including the original production and cast recording of Little Women. His successful experience on Broadway allowed him to play such memorable shows as Les Miserable, Phantom Of The Opera, Sunset Boulevard, Victor/Victoria, Miss Saigon, and Beauty and the Beast. He continues his passion for this style of playing in a variety of theaters around Pennsylvania. Professor Lusk’s performing and teaching has also taken him to South America. He has toured Chile as an artist/clinician, teaching and performing throughout the country, including a performance of Raymond Premru's Concerto for Tuba with the Orquesta Sinfónica de Concepción and Robert Spillman’s Concerto for Bass Trombone and Orchestra with the Orquesta Sinfónica de Chile. Mr. Lusk was also invited to Argentina as an artist/clinician. His performance with the Orquesta Filharmónica de Buenos Aires was the first time a trombonist had been a soloist in the history of the legendary Teatro Colon. Since 2014, Professor Lusk has done significant performing and teaching in Cuba, including the upcoming premiere a project he conceived entitiled Pictures at a Cuban Exposition. Professor Lusk is honored to be a member of the teaching faculties at the Cleveland Trombone Seminar, Interlochen Summer Camp and the Interlochen Low Brass Institute. Each year, Professor Lusk tours as a soloist and with various groups that take him to numerous universities, educational conferences, and high school music programs across the United States. He has often performed at the American Trombone Workshop, New York Brass Conference, and the International Trombone Workshop where he was invited to conduct the William Cramer Memorial Trombone Ensemble of College Professors. 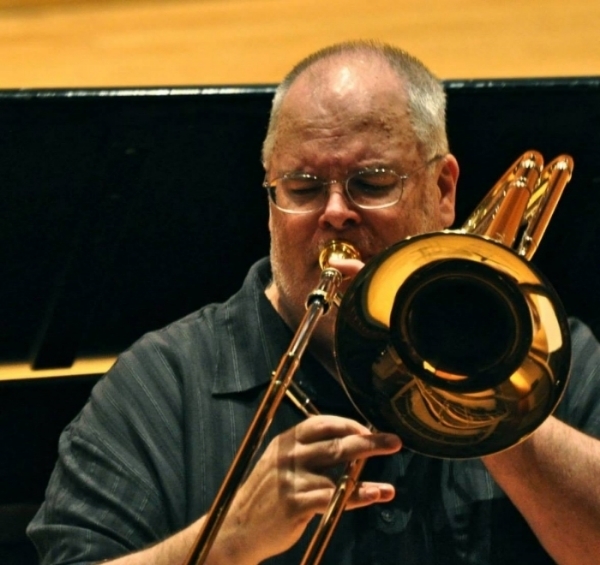 Mark Lancaster Lusk, Professor of Trombone, joined the Penn State music faculty in 1986. Prior to his appointment, he enjoyed a varied career with such diverse groups as the Woody Herman Band, the Chicago Symphony Orchestra, the Eastman Wind Ensemble, and the Chicago Contemporary Chamber Players. He continues to have an active playing career as a soloist, clinician, and freelance musician. Lusk has toured the world as an active member of the Woody Herman Alumni Band. He has also performed on Broadway. Lusk’s performing and teaching has taken him to South America, including Chile, Argentina, and Cuba. He holds undergraduate and graduate degrees from The Eastman School of Music and a performance certificate from Northwestern University. Lusk is an artist/clinician for S.E. Shires Trombones, and is published by Lyceum Press.